Wedding RSVP examples can help you decide what to print on the response card accompanying your wedding invitation. Some examples of RSVP cards are simple while others address specific types of weddings, such as adults only. RSVP cards can often be purchased in bulk with invitations and may be included in the price or discounted. You can also do it yourself at home with a computer on cardstock to save money. Whatever you choose, you will need to figure out the RSVP wording. Most couples use the simplest form of response they can, to make it easier on themselves and guests. A response is requested by May 30. Couples who are having a choice of two or more main dishes may need to find out how many people request each dish. We hope to celebrate our special day with you! Kindly reply by the 20th of April. A favor of a response is kindly requested by the 30th of March. Please reply by the 20th of March. When mailing out wedding invitations, most couples include an RSVP card. However, both couples and guests may not know the RSVP etiquette that needs to be followed. Typically, RSVP cards are an insert in the wedding invitation. It can be written out on a postcard or be a separate card with envelope. 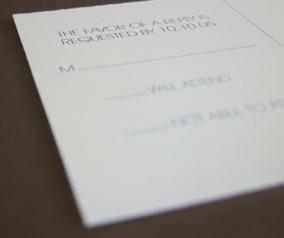 Invitation etiquette is that all RSVPs should be pre-posted for guests, meaning the guest does not need to add postage. If you are watching your budget or have a large amount of guests invited, a postcard is the cheaper option. RSVPs are often requested to be returned three weeks before the date, because caterers usually require a fairly estimate of people they will be serving two weeks in advance. This way, a couple has time to call anyone who did not reply. The most accurate count possible is best, so you do not run out of food or get overcharged for food not eaten. For weddings with a formal, seated dinner at the reception, couples might choose to make an assigned seating arrangement. This, too, requires RSVPs to be sent back in a timely manner. If you are making the RSVP cards yourself, you will want to print a few samples to check ink quality and alignment and to make any changes to the wording. Those who are going through a printer or ordering invites online may be able to request a sample be printed or emailed for their approval before the order is completed. Double check the RSVP sample for errors in spelling, reply date, and layout design before giving final approval. Once the requested RSVP date has passed, give guests a few days extra for any responses mailed on the response date to arrive. Then you or the hosts of the wedding should call anyone who has not responded. For persons who were invited "and guest," a couple should find out the name of the guest for seating arrangements, if necessary. A RSVP card can help make your wedding planning easier. Although you may have to give a few people a call to find out if they are attending, it will make planning easier in the long run. Use wedding RSVP examples to find out how to word yours, based upon your wedding reception needs.